Maximizing your time when traveling can be very beneficial. For years, people have been listening to audiobooks, learning languages and taking audio courses in their cars on the way to work to help them benefit from the traffic and drive. Learning a language like French in the car doesn’t sound too difficult to pull off. Being able to jump in and start learning using audio can be a very productive way to start learning a new language. French is spoken by 220 million speakers worldwide, allowing you to connect straight away with your new learnings through audio. Audio learning is used by any learners to help acquire information rapidly. Many people have turned to using resources like audiobooks to help read a book with speed, against having to read the full book in person. Audio learning is beneficial for those who are time poor. Spending time on reading can sometimes take a significant portion of your evening, so making sure you can maximize your efforts is a great way to get ahead. An additional benefit of using audiobooks is hands-free learning, which means it’s perfect for everyone from taxi drivers too early morning runners. Due to the nature of language, people find that learning French with audio or video benefits their learning due to the nature of multimedia to help them improve their pronunciation and fluency. Audio learning doesn’t only improve the vocabulary acquisition but the accent that you will be speaking French in. There are a wide variety French audio courses to take advantage of, many of them reside in the form of CDs allowing you to learn on the go. Beneficial for cars with CD players, but a pain for those without one. French audio courses can also be downloaded from your iOS and Android devices for offline use so you can avoid the CD players all together, allowing you to listen without the mess of CDs in your glove compartment. The audio courses will take you through a series of structured lessons allowing you to practice your French aloud inside of the car for effective practice. Improving your French can be easy, even with a passenger, get them involved and they’ll be impressed with your eagerness to learn. Even if they don’t get involved, it’ll be great to have a laugh with them and practice your fluency and accent, as long as it isn’t demoralizing to your French learning. Collins French Audio Course: For easy learning – here. Paul Noble: Your Personal Language Coach – here. 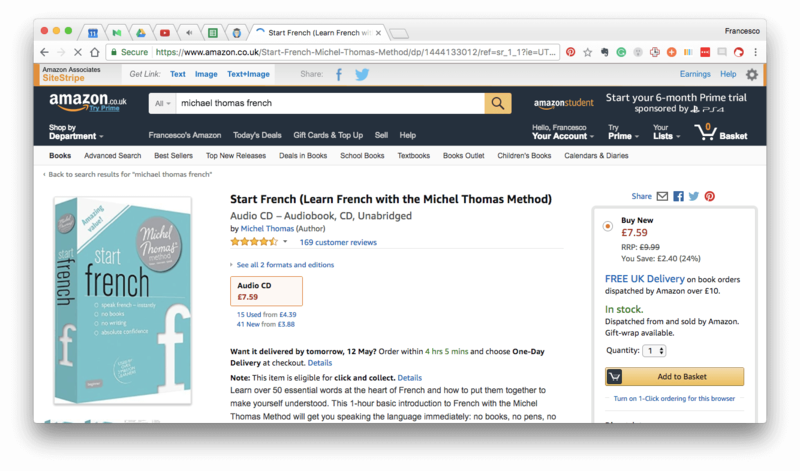 Michel Thomas: Start French – here. Audio doesn’t have to mean a French language course that requires focus and intensity. If you are looking to brush up alongside the course, or you are more advanced, using your AUX cable or even your phone’s speaker will give you access to your phone’s functions to connect with a local or national French radio station. French national radio stations can help you to develop your fluency and accent. The speed of the hosts might scare you at the start, but it’ll help you improve the speed in which you understand the French language. 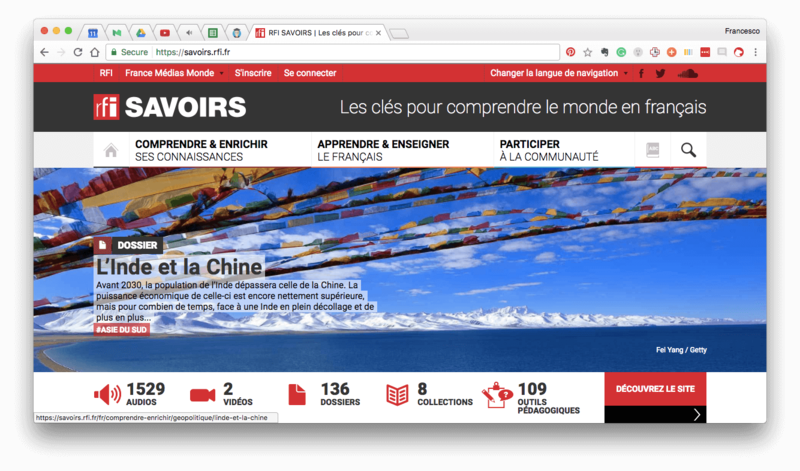 Savoirs – Radio France Internationale listen here. BBC Afrique – French-speaking African News – listen here. French Connection – Interviews with French people – watch/listen here. French TV outlets – listen to some TV – watch/listen here. With all the TV stations recommended above, we recommend aiming to listen to their broadcasts, against watching them. The audio will still provide you with an effective way to start immersing yourself in the French culture. 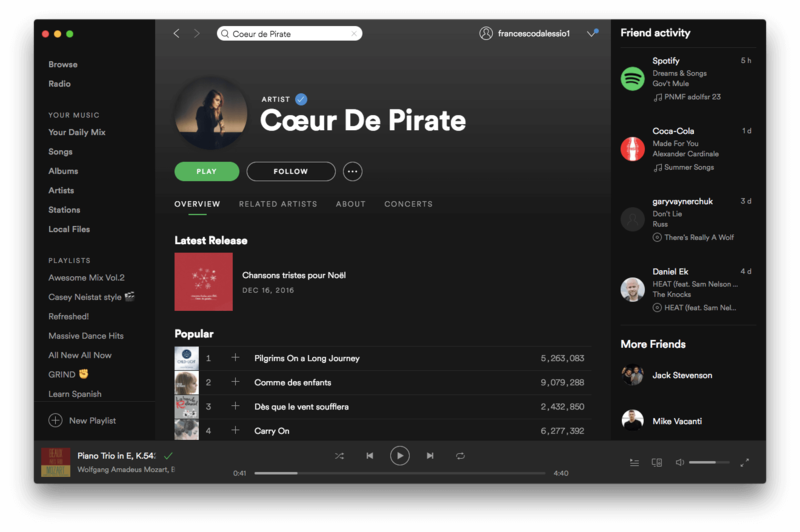 Spotify provides an excellent channel to connect to some French artists, from everyone like Black M to Stromae. This form of audio learning will help your immersion into the French culture by exposing you to country’s music of choice. Giving yourself some time to explore the vast range of music will help open your eyes to new elements of a language, you’ll be able to pick up new vocabulary and improve accent. Plus, it’s awesome to listen to native speaking music, the perfect motivator for learning. Coeur de Pirate – hear her work. Camille – hear her work. Edith Piaf – hear her work. Spotify also has a nifty way to try some French vocabulary practice. Here’s the Spotify Playlist for Learn French. Before you get started with your French learning, remember that using audio as a form of learning can be applied to areas outside of languages and can be very beneficial for your time. Audio allows you to optimize your hands for whatever need, that’s why it’s popular with drivers, runners, commuters and more. Dipping into a course, station or even learning video with no audio can be incredibly useful when it comes to saving time when you are out and about. Reducing excuses for your language learning, thanks to it’s open approach to learning. Learning in the car won’t feel like learning with a passive 20-30minute drive you’ll pick up new vocabulary in no time and impress all of your friends and family when you arrive home with all the French still fresh in your head! It’s these small moments in your day that help build towards this big mission of learning French. You’ll ace it! Here are some of the many benefits of audio learning that you might not know. All of these benefits will feed into the other methods of learning you decide to go with. Well worth getting in your car and learning ASAP! Let us know in the comments if you benefit from audio learning and any recommendations you have for your French learning with audio! Learning French using audio can be a great way to acquire new vocabulary, improve your fluency and master your accent.